BB: The Black Forest is your first book, while also one of many you have written over the years in coming up to it. Did you know this book was a specific project when you began the poems in it, or how did it come together as what it is? CD: For three years while I was getting my MFA I only worked on this one thing, a sequence of poems called The Confessions. When I started that project, I had just been blown absolutely away by Berryman’s The Dream Songs and Berrigan’s The Sonnets, and I had this feeling that maybe writing a book-length poem was the solution to all of my problems. I remember at the time being very confused about how to write poems: before grad school, I had been writing pretty much on my own for a few years, and the poems I wrote were not very good, and all of a sudden I was around all of these people who seemed to already have really confident, singular styles, and I felt like I didn’t know what I was doing or (more importantly) even what I wanted to do in writing poetry. The most helpful thing about just writing this one project for so long was that it gave me a stable architecture of form to write into. And that was huge for me, because I felt like just starting to write an individual poem was a process weighted down with huge decisions, decisions about form and content that needed to have complicated rationales lurking behind them. So for three years, I didn’t have to worry about that, because I was totally committed to just working on this one thing. And by the time I finished working on it, I was ready to realize that the way I had thought about the process of making poems before was actually totally wrong (for me at least) and that one good and valid way of composing poetry is to just start writing and to see what happens. So when I started writing the poems that would eventually compose The Black Forest, there were no ideas about the poems going together or belonging together as a certain project: there was just this feeling of freedom, and a desire to be loose and wild with my imagination. I had just started running when I began to write these poems, and a lot of the first lines would occur to me while running, and then I would spend the rest of the run saying the line over and over to myself to try and remember it, and by the time I got home the line would have achieved this power, this importance borne of repetition, so I’d write it down and often the rest of the poem would come out very quickly. And over time, I did realize that a lot of the poems I was writing belonged together, that they shared a lot of language and concerns, and it felt good to realize that the consistency of the book had come together in a fairly organic way. BB: That you began running during this time is interesting, as I thought the use of motion and propulsion in the book was so strong. Many of the poems I felt had an interesting interchange between really stark imagery, such as bear suits or pretzels, interspersed with a more dreamy, logical monologue voice that seemed to carry the opening forward, almost like a mathematical proof, though with all the actual math deleted. It’s both scientific and dreamlike. I wonder what you would say about the use of logic in your poems, versus perhaps the use of dream material, or the image of a tree. CD: I really like that you used the phrase “dreamy, logical monologue voice.” I think that’s a perfect way to describe the mechanism that powers the poems in The Black Forest. To me, each poem in the book is a narrative monologue, and what powers the narratives is not plot so much as discovery: the speaker of each poem is discovering the way they exist in the time and space of language. And for me, that’s where a lot of the excitement of writing poems comes from. So a lot of the spine of these poems comes from that generative impulse. At the same time, though, I am a huge reviser of my own poems, and over time I like to interject shifts and stoppages inside them to complicate and compliment their basic shape. In this impulse, one very important influence on my work has been Dan Bejar/Destroyer. I really love the way his songs interrupt themselves to suddenly proclaim things like “it was 2002,” or “Thursday, 10 PM” and it’s like oh yeah, it’s good that all of a sudden in this song about something else entirely now we know that it’s 2002, or now we know that it’s Thursday at 10 PM, because this information is totally crucial and completely irrelevant at the same time. And I think maybe that’s the case with a lot of the “stuff” inside my poems: the pretzels and bear-suits gain a certain power because they are the only things in the poem-rooms each voice inhabits. I like how naming them makes them so important, so for example that pretzel becomes sort of the realest thing in its poem, the center around which the terms of the narrative space of the poem flexes and distorts. It creates space by filling it. It absorbs light. As far as dream material goes, it’s tricky because there are so many easy connotations that go along with that: the Surrealists went all in with their dreamy ways, and Breton was way better at PR than anyone ever, and now it seems like as soon as a poet gets equated with dream material or dream logic, they are automatically lumped in as some poor copy or iteration of the Surrealists, and it’s like, hey go wear this Snideley Whiplash mustache and stand outside with all the other boring re-enactors. It almost feels like (for its detractors) the idea of Surrealism has become the poetic equivalent of Swing music: all quotes, no fun. And I have already gotten called a Surrealist, and I do understand why, but there are other movements and poets that I feel much more in concert with. I mean, I really would like to believe that The Black Forest is very much in the Cubist tradition of Max Jacob and Guillaume Apollinaire, whose poems are extremely awake and caffeinated and yet still have a kind of dreamy logic to them, specifically the weird logic of what happens when you realize you’re dreaming, which can lead to feelings of extreme power over space, time, and reality, but can also lead towards ridiculously absurd logic. Here’s an example: I recently had a dream in which I had an amazing idea for a poem to write. After I had the idea, I realized I was dreaming. I decided that I really wanted to figure out a way to remember this idea after waking, because it was probably the best idea I had ever had. And so then the dream turned into this extremely involved and stupid quest to try to find a cell phone, because it made total logical sense to my lucid dreaming self that if only I could find a cell phone, I could text-message my idea to my own phone number. Now, obviously this was insane. But I am very attracted to the certainty of that kind of logic, and I think most of the poems in The Black Forest are about the process of a voice/character looking for logic, and through that logic (though it may be flawed) attaining a kind of recognition, though it may be flat or small or un-epiphanic. BB: I think all of what you are saying here is well reflected in the book, and strengthened by the motion of the three sections: The Forest Fire, The Hidden Forest, and the Black Forest. Would you talk about the decision to split the book into those sections? CD: When I first started putting the book together, all I knew was what I wanted the first and last poems to be. Other than that, not much was clear at all. I did have a sense that in some way I wanted to make the book grow more interior as it progressed; for the nature of the reality the poems inhabit to cast longer shadows. Looking over The Black Forest now, it seems to me that the first section is full of poems that look outside themselves at the action of the world, the second section is full of poems looking back at the histories that have led to their current realities, and the third section is trying to solve the question of what happens after a poem has become cognizant of the world it is in and the history that informs it. As far as naming each section, for a long time, they just had numbers. But when Zach Schomburg was editing the book, one of the questions he raised had to do with sections and section numbers, and being tired of section numbers, and wondering if there might be any other way of organizing or shaping things. It took a while for me to come around to that, but then one day I was looking at the poems and I realized that the last section in the book should really be called “The Black Forest,” like that name could be a flag they all huddled under, and from that it was pretty easy to come up with names for the other sections. I am really happy with what the named sections do: they provide little hints of context, establishing mood and situation without overly determining the reader’s experience of the book as a book. To me, that seems friendly. BB: Another thing I found very interesting was how time seemed really strange in the context of the references and sometimes the way the speaker talks: there is so much nature and exploration of feeling that seems timeless and pervasive, almost fabulist maybe, and then there will be a way of speaking or a reference to something very modern, such as rating things “Hot or Not” online, or “I’m not joking when I say / they called my mom the Cannon.” I think it further adds to the dreaminess of it, and I wonder how important time was a construct for you in both writing the poems, and maybe in organizing them later? CD: I wanted to experiment with time with just as much freedom as I was trying to think about space: as I was writing, I hoped to remain open to the possibility that just as each poem might discover the space in which it was located, they could also discover where they were (or weren’t) in time. There are so many wonderful gradations to this: a poem can realize that it is 3 PM, or “evening,” or Winter, or “back then” (which could mean anything) or the Dark Ages, or 2004, or anything. I think reading Tomaž Šalamun was extremely instructive for me in this regard; I love the way the time stamp or dates in his poems can sometimes actually function as the centers of reality from which everything else radiates outward, and it’s amazing, really, how little it matters of those times are “true” or not, but what does matter is what they allow the poet to build around them. Sometimes before I start writing a poem or working on revising a poem, I like to sit in the study and read other poems for a while, which helps me remember what good poems do. In The Black Forest, there’s a poem called “Heart of 5000 Bear” that I had been sort of stuck in the middle of for a couple of weeks, and I was sitting down one Saturday with the intention of reading for a while and then working on trying to figure out the second half of this poem. That day, I read a Šalamun poem from 1984 called “Sonnet About Milk,” which contains the sentence “Today is Friday, March 7.” I felt excited, because on the particular day when I was reading the poem, it was Saturday, March 8. Even though more than two decades had passed between the day when he wrote the poem, I felt connected through time (or despite time) with its existence. I wanted to mark this somehow in my poem, so I wrote the lines “It’s March 8, a Saturday./ I’ve been sleeping in this poem/ for several weeks,” which carried me towards an ending I wasn’t expecting at all, but that I am very happy with. 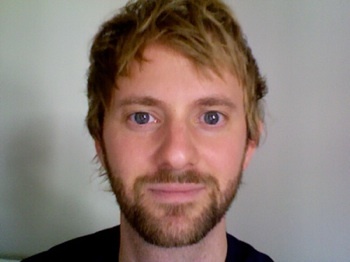 In terms of organizing the book, I think the first section introduces a fictional present, an assumed now that hopefully feels “real” enough to hold all the dreaminess you mention, in which the world of the poems as well as the time they take place in becomes increasingly confusing/confused. I begin the book with the poem “Beat the Ranger,” whose first line is “I am from extremely real streets” because I want it to be clear that there is reality at the core of this entire book, that for a world to be dreamy, someone needs to be dreaming it! I also hope that the book’s epigraph, a quote from Shackleton about the difference between perception and reality unfolding over time, helps to suggest this idea. BB: Any closing feelings on the process and/or feeling of finishing, sending out, and publishing your first book? Any word for the future? 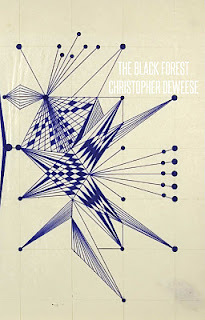 CD: It feels good to have The Black Forest out in the world. I think it’s a lucky thing to get to work on putting a book together with people who care about the poems and who also happen to have good ideas. Looking back over the book, I know it wouldn’t have turned out nearly as well if Zach hadn’t been my editor or if Drew Scott Swenhaugen hadn’t designed the book itself. They both did phenomenal work on making the book as sweet as it could be, and I love the way it turned out. I love the texture of the cover, the French Flaps, the quality of the paper: everything. Before the book existed, I didn’t really think very much about giving readings, but there’s something about having the book to read from that I think has suddenly made me better at reading out loud, which I find interesting. It’s like each poem has more gravity now that they are sewn into this physical thing with real weight to it, or maybe it has to do with my desire to lead everyone who is there in the room on a path into the world of the book. Whatever it is, it’s made me excited to take the book out on tour, and I’m hoping to put together a few readings this summer and fall. As far as the future, I want to try to avoid writing the same poems over and over. I’ve been thinking about this guy named Ted Serios who was a Bellhop in Chicago in the 50s and 60s who claimed to be able to make photographic images appear using only the power of his mind. He called it Thoughtography. I’ve been thinking about trying to make poems happen using only the power of my mind, and I’m not sure exactly what I mean by that. The Black Forest is available now from Octopus. Excerpts can be found at Chris’s blog.